SORRY, THIS HAS BEEN RENTED. Please contact me to find out if it will be available any time soon. An application form must be filled out to be considered. 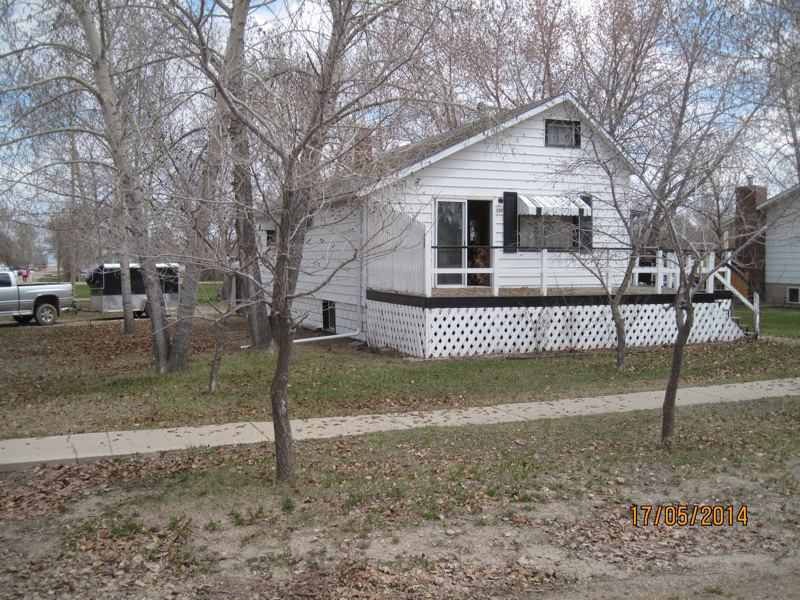 Rent will be $[ask for current price] including furnishings, utilities (water, power, gas, telephone, internet). Damage Deposit equal to rent and due when lease is signed. This house is furnished with 'retro' furnishings and will remain that way for the foreseeable future. 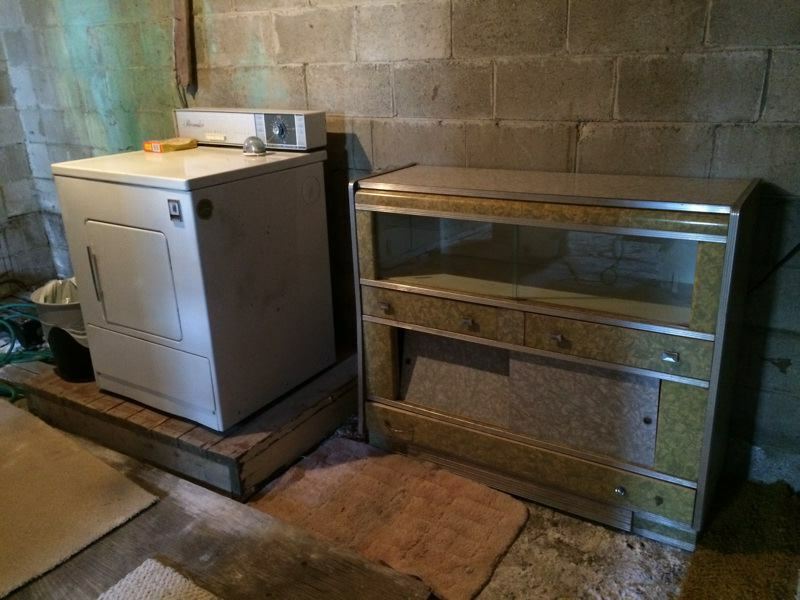 The fridge, stove, microwave, furnace and hot water tank are new, but the rest of the place is 1950s - 1970s. Tenant is responsible for shoveling the walk in the winter. (There is only sidewalk on the front of the lot, not the side, so there is only about 50'). 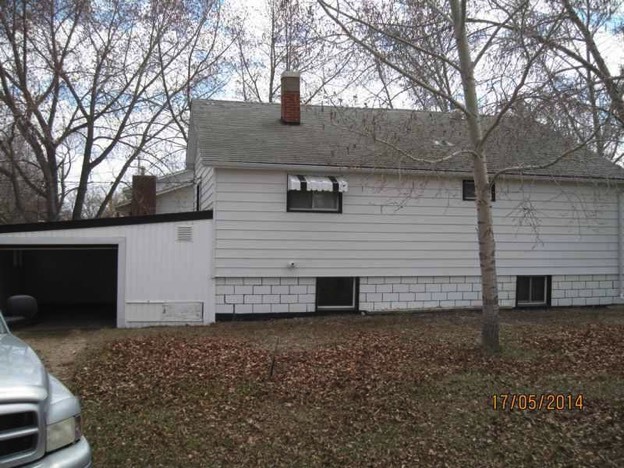 Accepted tenant must be self sufficient because we are not around in the winter, so any problems that arise, you must be able to rectify those yourself. If it is beyond you, we will arrange for a professional to tend to the problem, but expect minor issues to be dealt with by the tenant. 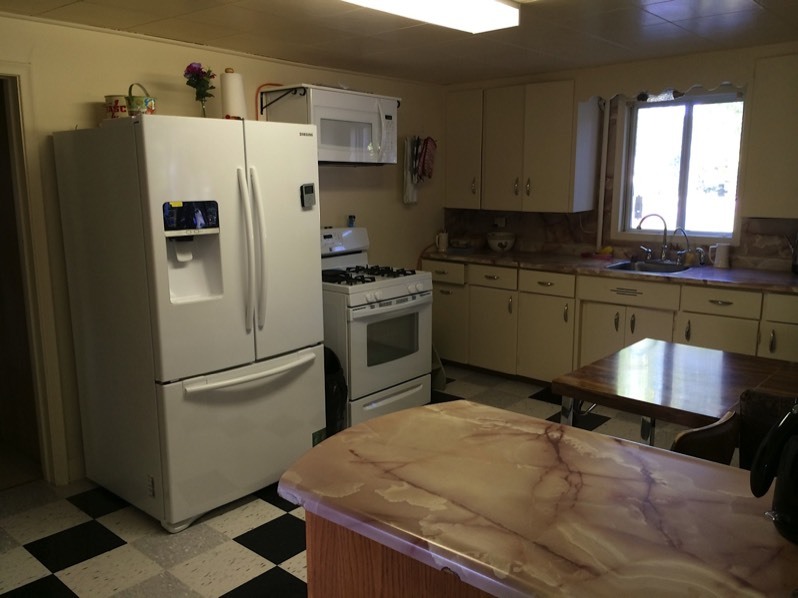 Kitchen is equipped with 5 piece dining set, brand new fridge, gas stove and microwave oven. The window above the sink looks out over the back yard. 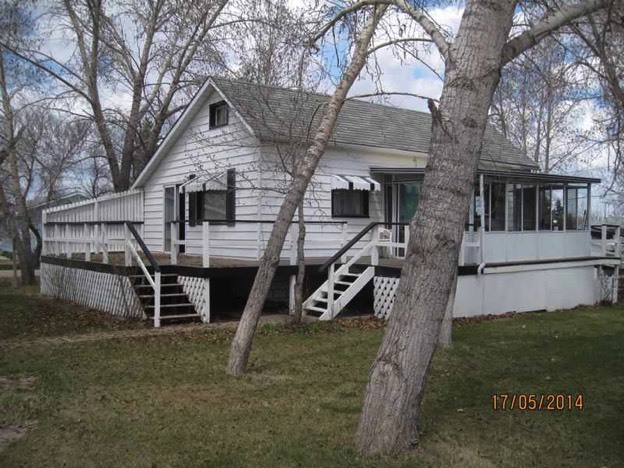 There is a large window by the dining table, letting in lots of south light from the sun porch on the SE side of the house (the streets run diagonally in Central Butte). The living Room is furnished with 1980s couch, rocking arm chair, and love seat, which is also a hide-a-bed, coffee table, writing / computer desk, 25" TV, and retro HiFi AM/FM record player stereo.. Large windows throughout make this a very bright house (but it was dark outside when this picture was taken). 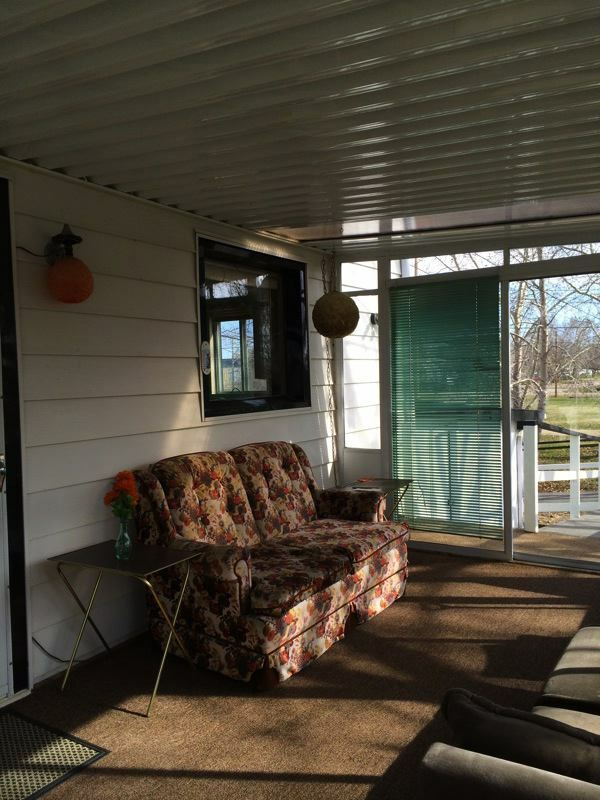 A love seat that matches the couch and rocking chair is in the sun porch. 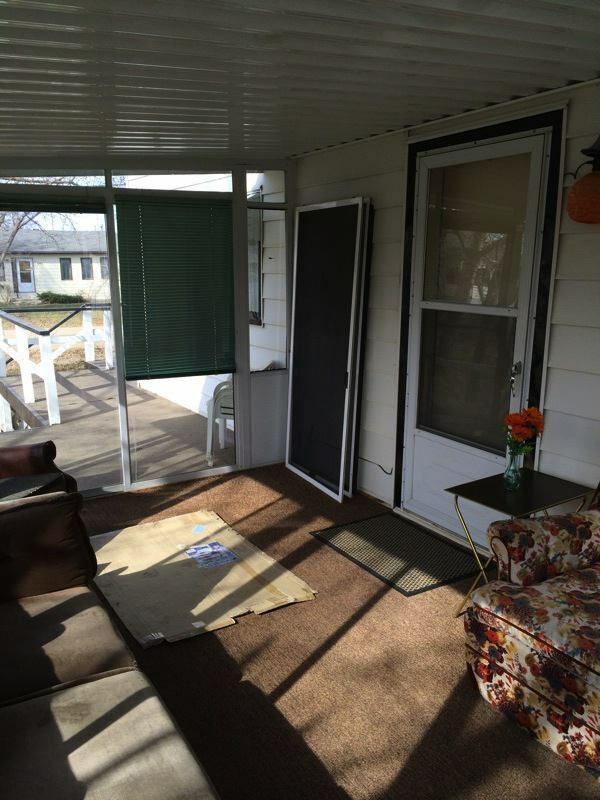 The patio doors lead out to the SW side of the house, to a sitting area on the large wrap around deck. The master bedroom is on the main floor. 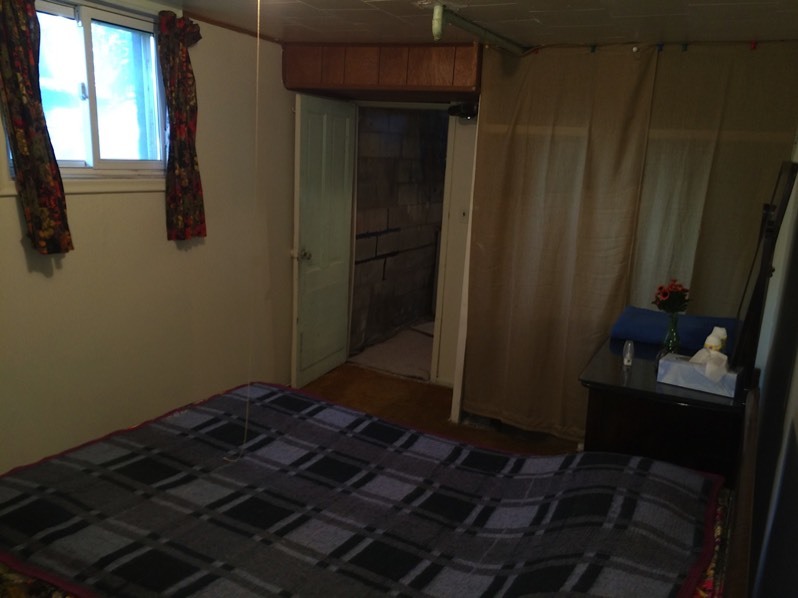 It has a double bed and a large closet. There is currently one chest of drawers in the room, with room for a dresser. 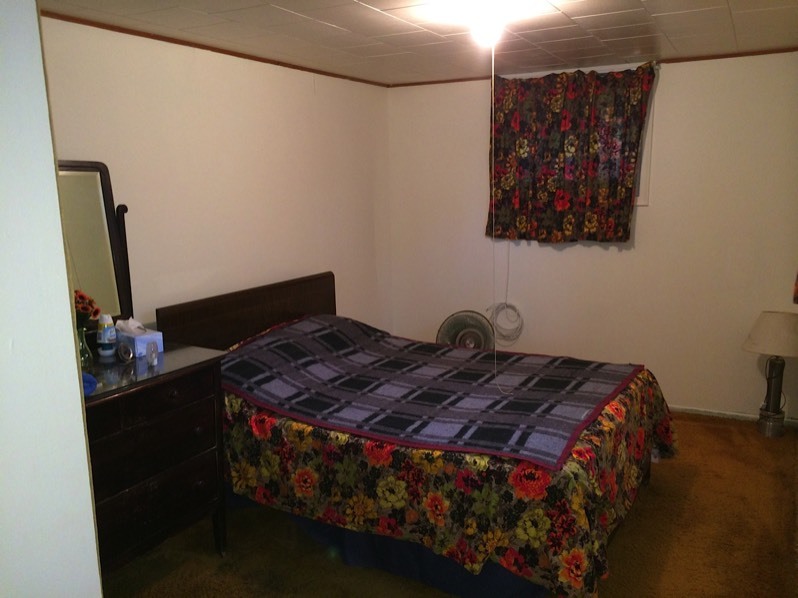 There are also two fairly large bedrooms in the basement. All mattresses are clean and in great condition, with very little use. All beds are double (54") beds. The floor had carpet and in this photo was awaiting VCT (vinyl tile) to match the kitchen and hallway, which has now been installed. 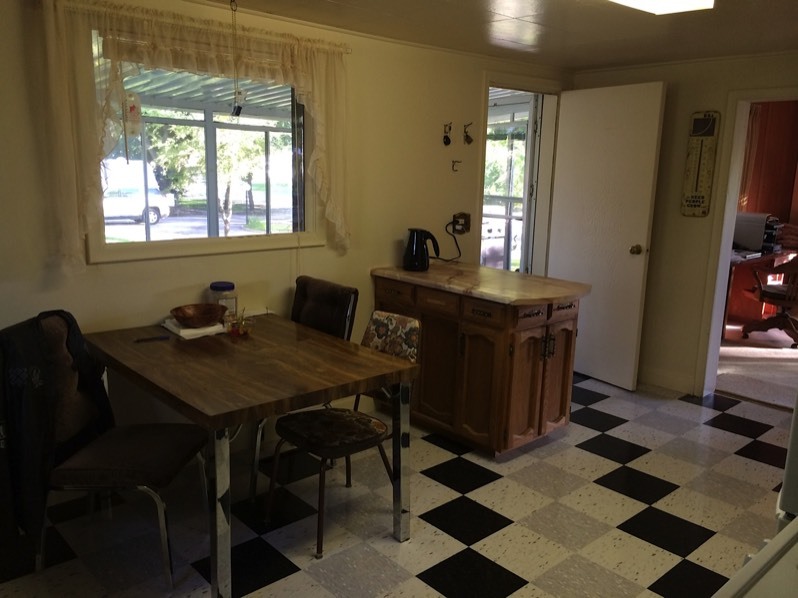 See the kitchen photos for the flooring pattern. 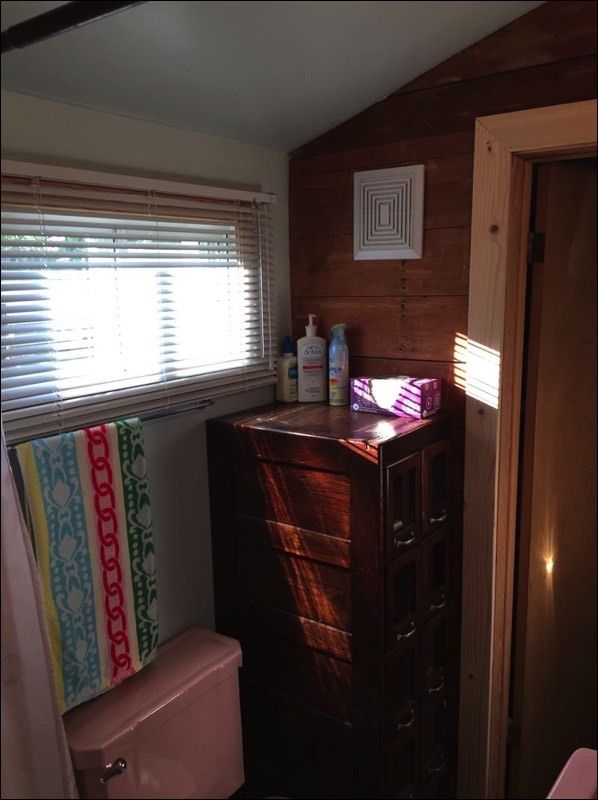 The door to the left is the bathroom. 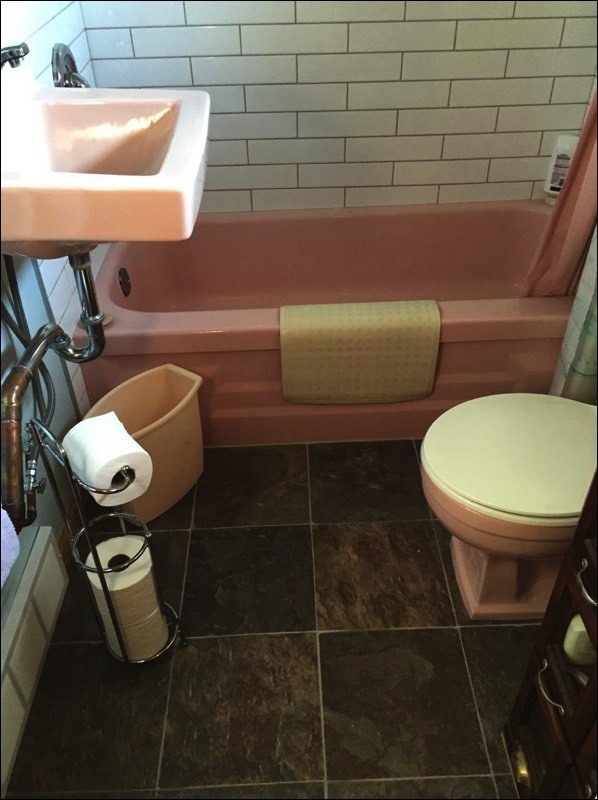 The main floor bathroom has been ‘modernized’ to include new ceramic tile tub surround and all new paint, but the pink fixtures remain, as well as retro lighting and accents have been added. 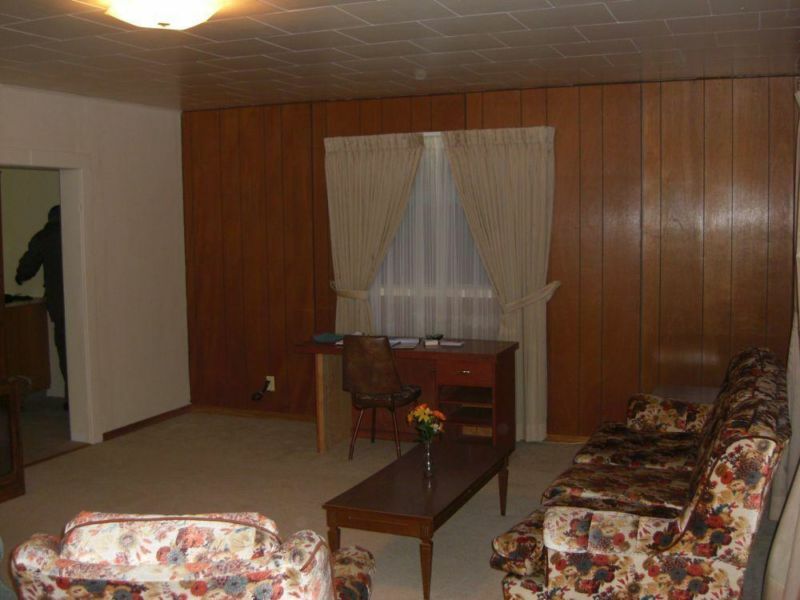 There are two bedrooms in the basement. 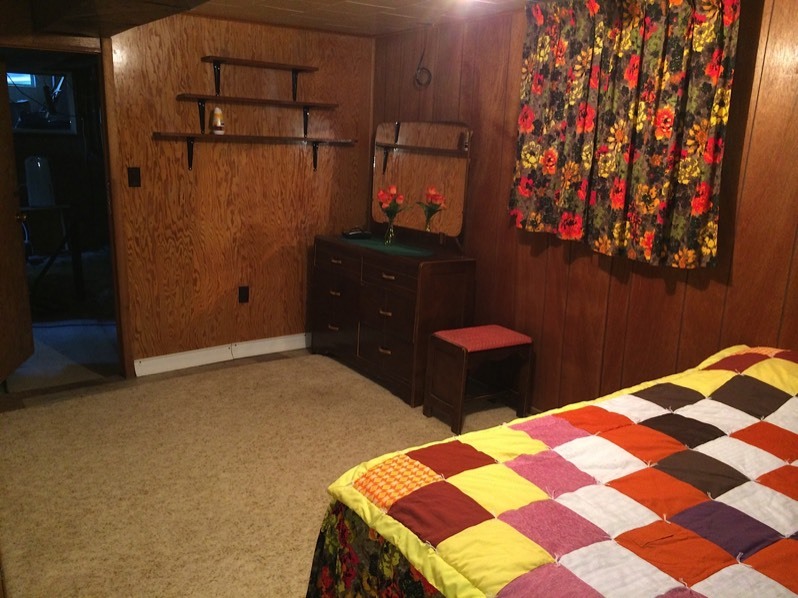 Both have double beds, and chests of drawers. This bedroom has large closets and an antique dresser and bench, as well as a small chest of drawers. 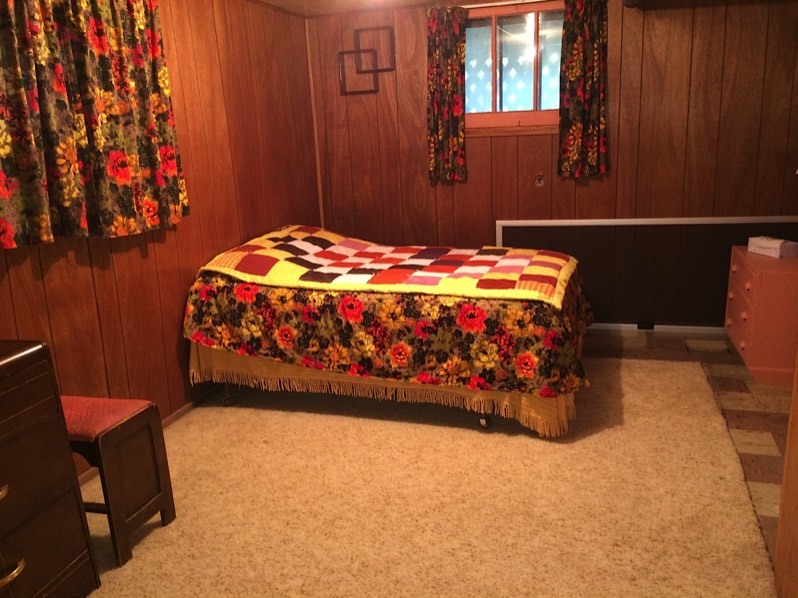 This is the other basement bedroom. 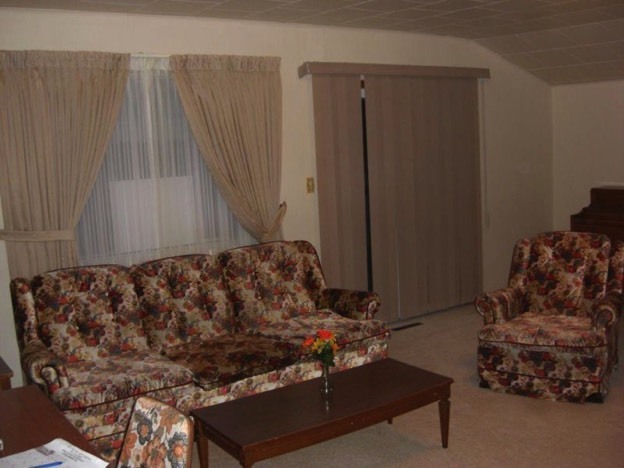 They are more spacious than the one bedroom upstairs, which also has a double bed. This bedroom also has an antique dresser. We began basement renovations last year so this bedroom has new flooring and a new closet (unfinished) and unpainted walls, but it much more airy than it was with the dirt floor. The top floor of the house might be classed as a 1/4 story, the ceiling walls slope almost right down to the floor, as opposed to a 1/2 story, which has vertical walls, usually 3-4 feet high. 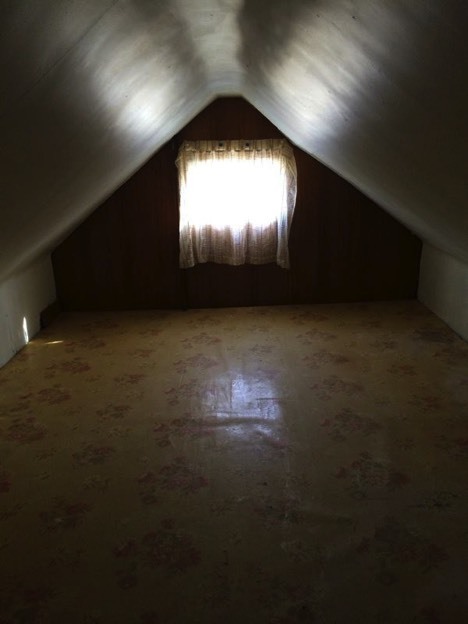 The centre of the attic room (the peak of the roof) is just a shade over 6' in height. It could be made into a bedroom if you're very short, or don't mind making the bed from on your knees! 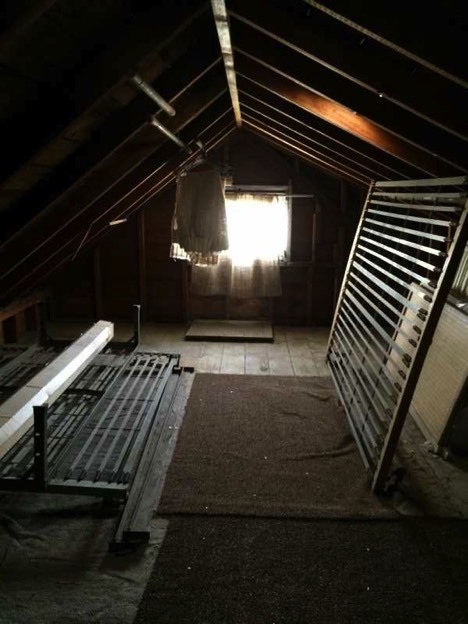 There is also a sweet little storage area in the attic room that is separated from the main room. It is unfinished (wood rafters) but has a sunny SW window in it. This little area would be perfect for a writing desk. It is closed off in the winter, to prevent heat loss. 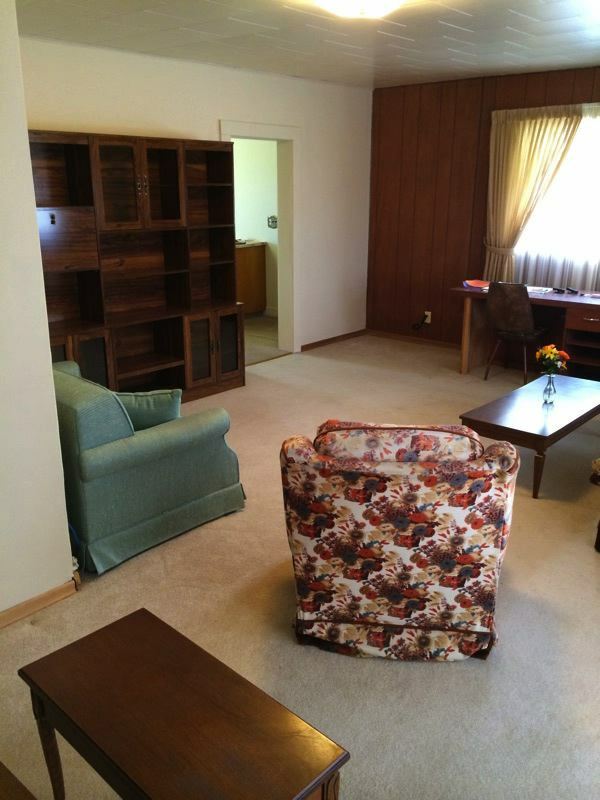 The other end of the upper floor is not heated nor cooled, but could be used as storage, or furnished with a reading desk for those ideal days. This part of the attic is very short, you'd have to be 5' or less to stand up in it. It will be closed off for the winter. 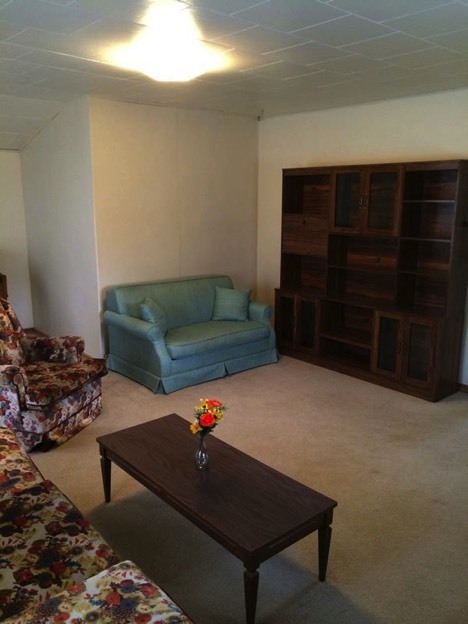 The basement has undergone a huge renovation in the summer of 2015, but is not finished yet. 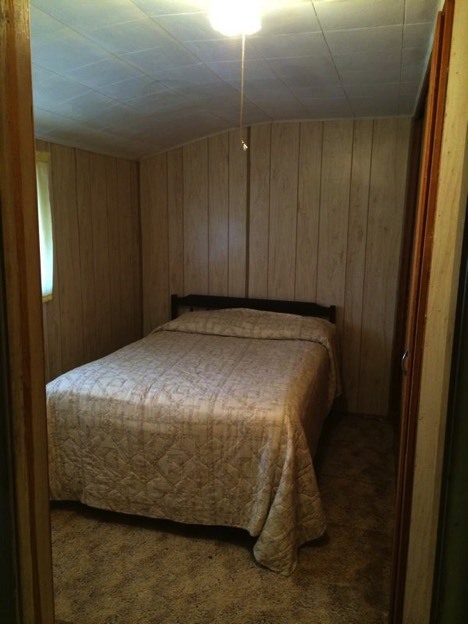 There are two bedrooms that are ready to use. We dug out the dirt floor and added a wood floor, as well as a laundry / bathroom but the it still needs to have the walls painted and the fixtures hooked up. 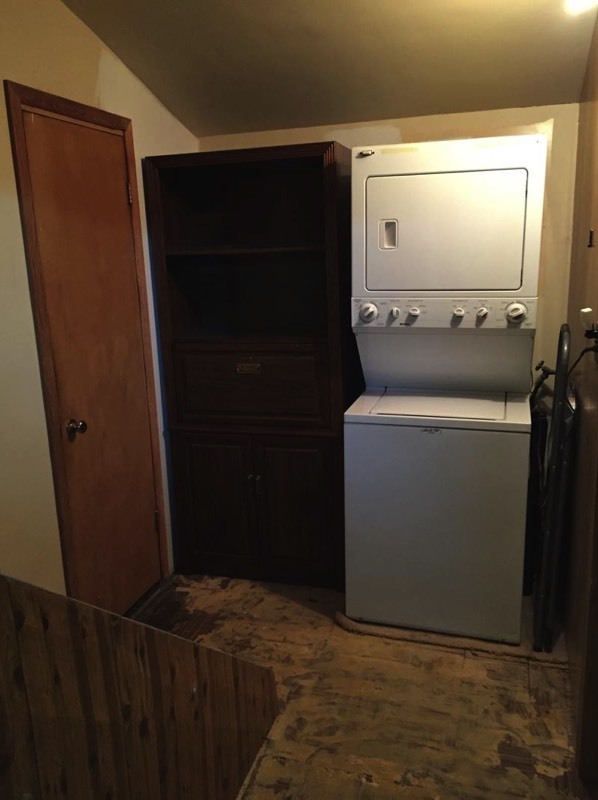 The basement is MUCH more attractive now, with a full height ceiling and modern furnace, and brand new hot water on demand water heater. 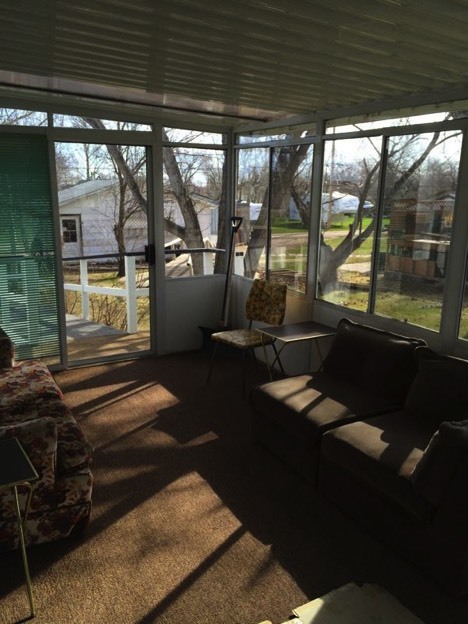 The large sun porch is on the SE side of the house and has a sliding door at each end and four sliding windows for ventilation. It is of a fairly modern construction. There are also screens for the sliding doors. 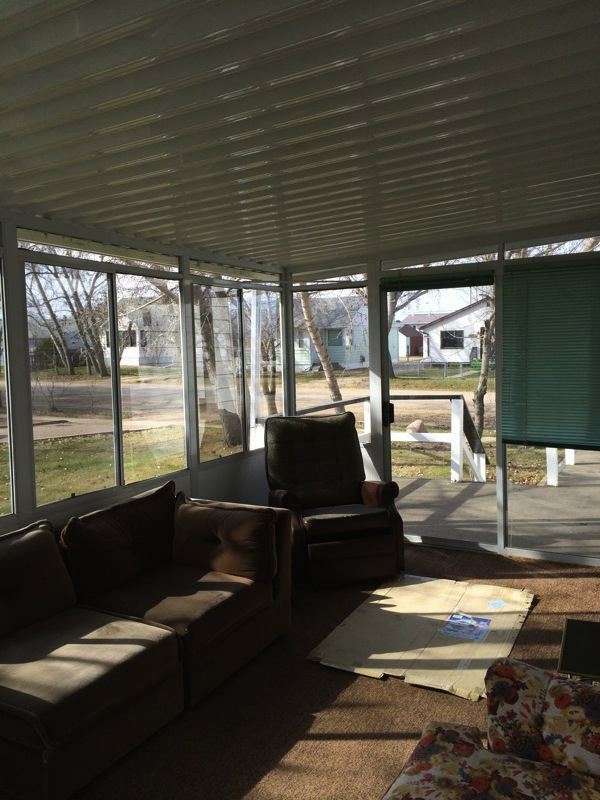 Made of modern materials, it features windows on three sides with mini blinds on both ends. Great for those cooler, windier, or mosquito-ey days. There is a short (in height) single car attached garage. The reason it's so short is so that the kitchen window was not blocked off. There is a doorway from the garage into the basement. The top of the garage door opening is about 5'2".